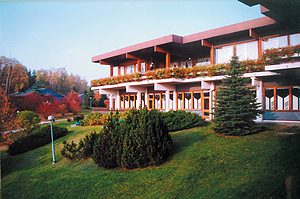 Located in the famous Mazurian Lake District, close to Czos Lake, the Mrongovia hotel offers relaxing holiday in a nice are on the slope of the Jaszczurcza hill. 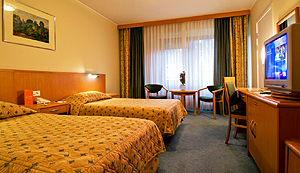 The hotel offers 215 double rooms. The hotel rooms are equipped with a TV Sat, a telephone, a bath and in some rooms a mini-bar. Some rooms are overlooking the Czos Lake. The bungalow consist of 2 bedrooms, a living room with fireplace, a kitchen and a bathroom with private sauna. The two restaurants: "Blekitna" and "Pensjonatowa" serve regional and international dishes. The guest are invited also to a coffee shop with disco, an aperitif bar, a snack bar and a grill barbecue in Summer. Three meeting rooms (theatre style) able to accommodate up toÂ 280 people are equipped with A/V aids, secretarial and interpreter service (on requests), a photocopier, a fax and a telex. To the guest disposal are: a currency exchange office, a hairdresser , flower shop, news-stand, perfume counter, fashion boutique, art and craft gallery, a laundry, a bicycle rental and a car park. Pets are permitted. The guest could spend their leisure-time at the hotel terrace, a billiards, a badminton, tennis courts, volleyball and basketball, various water sports at 200 m, a horseback riding at 300m, a fishing at 300 m, a biking and a hiking. The relaxation and health center "Resort & Spa" in Hotel Mrongovia offers anti-aging and stress relieving treatments that increase mental and physical fitness. Massage services, beauty parlor, solarium, sauna and steam bath will help guests improve their health and relax. The hotel offers modern pool complex with 4 swimming pools, one of which has a 40-meter slide where adults and children will spend relaxing time. 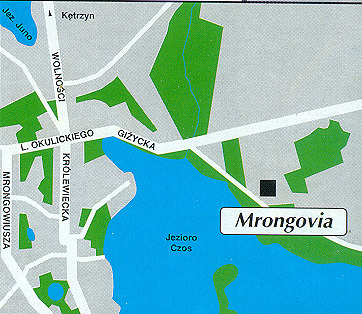 Hotel Mrongovia is situated on the slope of Jaszczurcza hill near the Czos Lake, in the famous Mazurian Lake District. The Railway Station 4 km away.